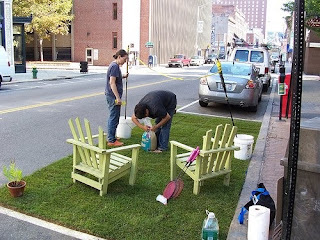 Where the Sidewalk Starts: Happy Park(ing) Day! Today we celebrate the many ways that parking spaces can be used--besides for parking cars. Check out the Park(ing) Day LA website for a map of all this year's spaces-turned-parks. And for those who can't make it to their favorite spot on Friday, the Hollywood Community Studio will be shutting down Hudson Avenue at Hollywood Boulevard for a "Pavement-to-Plaza" demonstration project full of fun performances and activities. Here's the schedule it you'd like to take a peek. SOOO EXCITED FOR PARK(ING) DAY! I will be in Westwood. Wish you could join us, Katie!